Discussion in 'Medium Format' started by erikestany, Apr 2, 2019. I'm looking for a light meter and I'm stuck. The intention is to use it to take pictures in low-light conditions such as night photography in the city with my Mamiya 7. Do I need a spotmeter? What options do I have new or used that are not very expensive? I allways used Asahi Pentax spotmeters, the newer work with modern batteries. Or can I use my digital Fujifilm x-pro 2 as a spotmeter?
. . . I'm looking for a light meter . . . The intention is to use it to take pictures in low-light conditions such as night photography in the city with my Mamiya 7. Do I need a spotmeter? No. A Spotmeter is a sophisticated bit of gear and unless you’re fascinated by the process of spot metering individual elements of a scene and then manually computing the exposure then I suggest you do not bother buying a Spotmeter. What options do I have new or used that are not very expensive? . . .
1. Use the meter in the Mamiya 7. 2. Use your Fujifilm x-pro2 as your Light Meter. I suggest that you use the selection “Multi”. It would be best if you use a lens or lenses which have about the same Field of View as the lens(es) that you use on the Mamiya 7. Take a Light Meter reading using the Fuji and then make a test shot using the Fuji and assess the image and the histogram, then make any adjustments to suit your requirements. Then if necessary take another test shot. Then use those exposure parameters for your Mamiya 7.
. . . can I use my digital Fujifilm x-pro 2 as a spotmeter? . . .
No. Even though the Fuji x-pro 2 has a selection tabbed “Spot” in its Light Meter selection I am reasonably certain that it will not work as a “Spotmeter”. Spot meters have their place, and I have a spot attachment for the Minolta IIIf that I use when the situation calls for it. A spot meter can also be dangerous unless you REALLY know what you're doing with it. Basically, if you point the spot meter at an object and take a reading with it, then transfer that reading directly to the camera, the area you metered will be recorded as mid-gray. A zone system practictioner would meter various elements in the scene and base their exposure on which "zone" they wanted each element rendered as. That's a HUGELY overly simplified explanation(see Ansel Adam's "The Negative" for a complete explanation) but is the general idea. City night scenes, in my experience, can be tough to photograph since you're playing with a huge amount of dynamic range. You likely will have street lights in the photo, and the chances of you being able to retain detail in those while also getting detail in other areas is very small. You have "spots" illuminated by the lights, and these can make night photographs interesting as different lighting chemistries can give colors all over the place. Also, you MIGHT see inside light interiors-especially places with large windows and good lighting like restaurants and store display windows. You then have very, very deep shadows. The exposures you get with your digital camera can be a good guide, especially if you look at the LCD and have an "aha" moment when you see one of them. None the less, digital ISOs don't necessarily correlate exactly to film ISOs/ASAs(the latter is based on a density vs. log of exposure plot, I'm not exactly sure how digital is defined but it's also my understanding that there are a couple of different definitions in use). In addition, especially if you are using small apertures, you may well find yourself into the area where you run into reciprocity failure and consequently you need to look at the data sheet for the film you're using and see how much compensation is recommended for the exposure time(I just checked Ektar 100 to get an idea, since I don't often do long exposures on film, and it said it's okay to 1 second but doesn't say how much to compensate beyond that-I'd think at least one stop. Provia 100f says it's fine to 128 seconds, and if I'm reading correctly says add 1/3 stop beyond there). I don't normally bracket exposures, but this is one area where I think it's well worth the time and film to do so, especially on transparency film. Spotmeters are pretty useless in low light. They sacrifice sensitivity for a narrow acceptance angle, and you'll be hard-pressed to actually see what the meter is aiming at. Most spotmeters bottom out at around +1 EV, whereas for low light you want something that meters down to -3EV or thereabouts. The point that Ben makes about the contrast range of cityscapes is totally relevant. On one hand it makes getting some sort of picture very easy - you can use a wide range of exposures and end up with a useable image. OTOH, getting the exact effect you want/expect is a bit trickier. The old saying of 'expose for the shadows and let the highlights take care of themselves' is worth bearing in mind. Decide where you want the deepest shadow detail, meter it and subtract 4 stops from that reading. I.e. give 4 stops less exposure than your meter reads from your chosen shadow area.... and then bracket as well! You have to be realistic though. You're not going to see the fur texture on a black cat hiding down a dark alley and get a nearby street lamp clearly defined. Curiosity - did someone suggest that you need a Spotmeter for night time city scapes? I've taken many night cityscapes with my Fuji 6x9 rangefinders and I use a Pentax Digital Spot meter. Yes, a spot meter would be the best choice because you are shooting high contrast scenes from far away. If you use a "wide angle" meter, you will likely overexpose. I'm not sure if it will be sensitive enough for night cityscapes, but maybe worth a try! "Night photography in the city" doesn't necessarily mean night cityscapes. If it's street photography at night, then a spotmeter's going to be a bit cumbersome. My favourite meter is a Quantum Calculight X. Very sensitive, with a fairly narrow metering angle - or incident - and an LED readout that's easily seen in the dark. The old Minolta LCD Autometers (III or IV) are also very good, but the decimal stop readout is a bit confusing and IIRC they don't have a backlight. 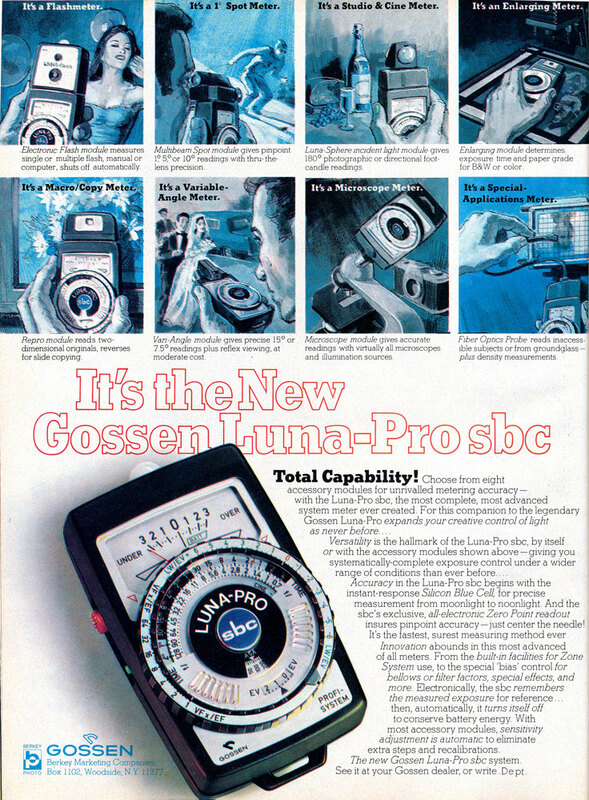 Just noticed that the advertisers of that old Gossen meter were so dedicated to photography that they've used drawings to illustrate its use. Simply try your Fuji’s spot meter for a range of shots with different light/contrast ranges. Blow a roll or two of 120 through the Mamiya and see what results. A combo 1 degree spot/incident meter like the Sekonic 5xx through 7xx series just might be within reach given what’s already in your bag. They’re a very handy tool. I’d pass on relics or incident meters with tack-on semi-spot attachments. Do not cherry pick out of context quotes to make replies with veiled ad hominem comments. Take this as your first and final warning. One last thing-tungsten balanced film is pretty much a thing of the past, but at the same time there's a fair bit of it still out in circulation and you can find some good cold-stored examples that are not terribly old if you hunt for them(I bought a brick of 35mm Kodak EPT not too long ago that has been frozen and expired I think around 2009). Tungsten film can add an additional interesting element at least if you're shooting transparencies. Bear in mind again my earlier statement about different lighting chemistries in street lights. Many of these are either monochromatic, or otherwise have a couple of distinct spectral lines rather than being continuous spectrum like incandescent. On daylight film, sodium will render as yellow-orange, while mercury will render as green. These are probably the two most common, but you might also see a mix of fluorescent and even LEDs these days, and these can have color balances all over the place. To see the affect of using a tungsten balanced film vs. daylight, try using the "Kelvin" setting on your digital camera to set the white balance. Daylight film is usually set for 5000-5500K, while tungsten can be 2700-3200K(tungsten film was mostly made for shooting under studio hot lights, which can have a somewhat higher color temperature than the ~2700K of a 100W household bulb). You didn't mention what kind of film you intend to use. If it's color, you might need to add color compensating filters to adjust for the color temperatures of various lighting.